My wife has been trying various biryani recipes. Over time she has trialed (unfortunately on me) these to come up with the perfect recipe for biryani. 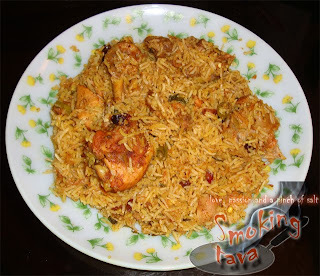 I hope you enjoy this recipe as much as I love savouring this delicious and rich biryani. I have not used ghee in this recipe, this is purely optional. The flavors in this recipe arise from the fresh ingredients used and grease from chicken fat and curd. Moreover I prefer rice-bran oil over others in all my recipes'. Grind the above into powder. In a vessel add in all the ingredients for marination along with biryani masala and chicken. Mix thoroughly and leave it for 2 hours. Soak basmati rice in water for 1/2 an hour and drain thereafter. In a kadhai, take some oil and deep fry onions till crispy brown (Make sure you don't burn the onions). Add the fried onions to the marinated chicken. Mix thoroughly and leave it for another ½ an hour. In a vessel take enough water (since we are going to par-boil the rice and drain excess water) to cook the rice. To this add bay leaf, cardamom, whole pepper, cloves and cinamon. Bring to a boil, add salt, add rice. Boil till the rice is half cooked (The rice is said to be half cooked when the grain breaks into tiny pieces when smashed between your fingers). Drain excess water with the help of a strainer. Heat 2 tbsp oil in a kadhai, add the marinated chicken mix thoroughly for 3 minutes on high flame (intention here is not to cook the chicken). In a thick bottom vessel firstly layer the chicken, press slightly and pack it well. Now spread chopped corriander leaves, chopped green chillies, squeeze a lemon. On top of this spread the half boiled rice, evenly. Sprinkle the saffron on top of this. Seal the vessel tight with the atta dough. Cook for 5 minutes on high flame, then 15 minutes on medium flame and finally 10 minutes on low flame. Switch off the flame. Let it stand for some time. Mix the biryani well while serving. Enjoy this delicious mouth-watering biryani with onion raita. Note. If you do not have a thick bottom vessel, you can also cook the biriyani in a regular vessel over a thick tava. Optionally you can add, fried rasins and cashewnuts on top of the rice. This recipe looks very inviting. Today we are preparing Vegetable Biryani. So we are following this prescribed ingredients except using mixed vegetables instead of chicken. Last week we tried oil-less Biryani and when eaten hot it was quite good.